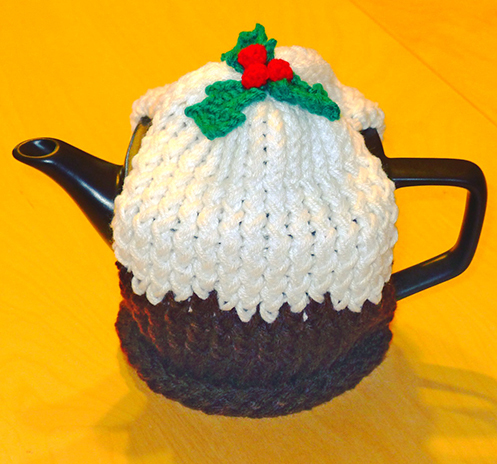 loom knit a plum pudding! I’ve actually never had plum pudding, but always thought it’s the cutest‐looking Christmas‐related thing! 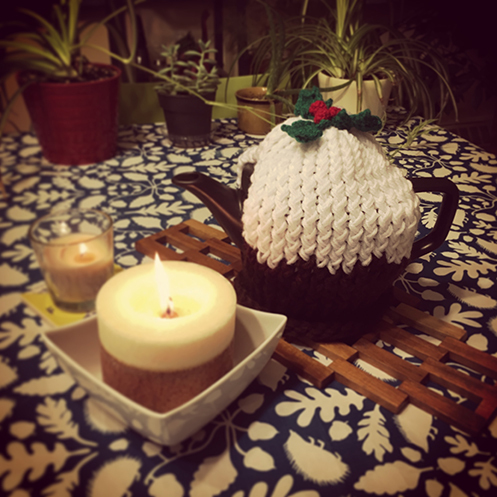 The lighting in my apartment is quite poor especially in the evening, but here’s a better look at the tea cozy. I used this 31‐peg loom, it came in a set of 4 by Loops and Threads at Michaels. 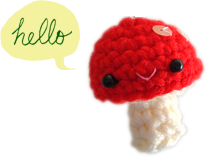 I bought it because it’s affordable, especially with the weekly Michaels coupon, for my first try with loom knitting. I’m not sure why this particular loom has an odd number of pegs, because I thought all round looms have even number of pegs… but it worked anyway. To begin, cast on using chain cast on (I learned using this video) with brown. Then, using e‐wraps (here’s a tutorial), work 8 rows around. 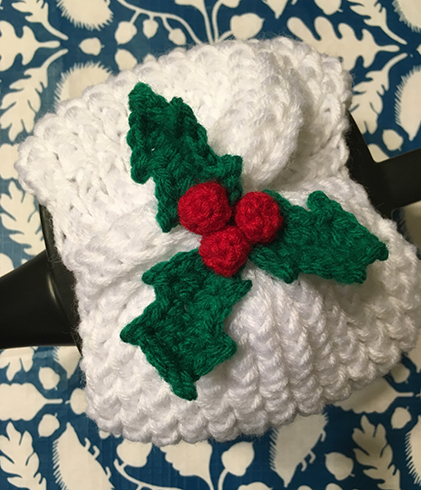 The tea cozy uses e‐wraps throughout. We now separate front and back pieces. Work 16 stitches back and forth (to create a flat panel) for 7 rows (video on how to make a flat panel here). Then, incorporate white using this chart. Start with the bottom row. Work two stitches of brown. Make a slip knot with white and put on next peg, and work this stitch. When wrapping the next peg with white, make sure that the brown working yarn is laying on top of the white working yarn, thus carrying the brown yarn along. Continue following the chart, carrying the brown when wrapping with the white, and vice versa. After finishing the chart, work 10 rows back and forth in white. 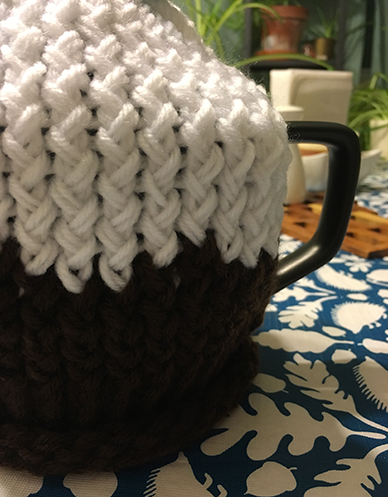 (My teapot is a bit on the tall side standing at 6.5″ including lid, so if your teapot is smaller, you can probably omit a few rows.) Cut yarn. Attach brown to the first unworked peg at row 8. Wrap and knit the remaining 15 unworked stitches for 7 rows. Follow the chart for the next 3 rows. If you have the same loom as me you would need to omit either the far left or far right column of the chart. Work 10 rows in white (or the same number of rows on the other side). Work 5 rows in the round. Tie and secure the yarn tail when you get to the peg where the yarn was cut at the end of the front piece. Leaving a long tail, cut yarn. Thread yarn tail in needle, weave needle through each stitch while taking the stitch off the peg, gather and cinch the stitches together, turn piece inside out, weave the needle through the gathered stitches a few more times and tie off. Weave in all the ends. Turn piece right side out. Leaves (make 3): Leaving a long tail for sewing, ch 10, sl st in 2nd ch from hook, through back loop only, *sc in next ch, dc in next ch, ch 2, sl st in 2nd ch from hook, dc in next ch, sc in next ch, dc in next ch, ch 2, sl st in 2nd ch from hook, dc in next ch, sc in next ch*, sl st in next ch. Now working on the other side of the foundation chain, repeat from * to *, sl st in last ch, fasten off, weave in this end. 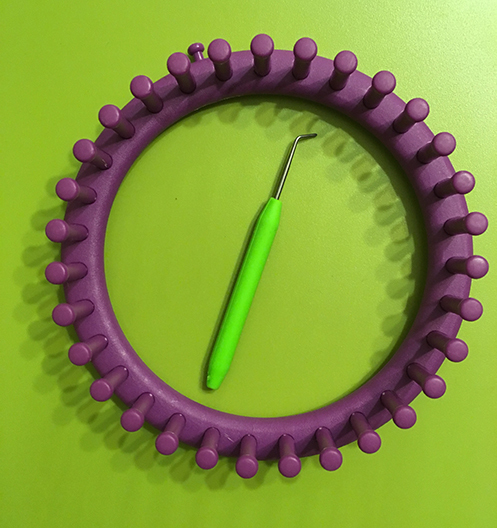 Berries (make 3): Leaving a long tail for sewing, 6 sc in magic ring, don’t join in the round, 1 sc in each sc for 2 rounds (or just work 12 sc’s), fasten off. Stuff tail end into berry. Thread beginning tail in needle, pull on tail to ensure magic ring is closed as tightly as possible, pass needle through the magic ring and the berry and prepare to sew on the pudding. Have a cozy, happy weekend, everyone!